Home » Comics » Did This Black Friday Comics Deal See You Coming? Daily Steals is giving an amazing Black Friday deal, that still seems to be on. $500 worth of comicbooks for only $35. Doesn’t that sound amazing? And certainly there are some fun comics there/ But $500? Even $35? We’re talking quarter box, with a couple more recent Thors and X-Men that might increase the value to, ooh, $10? If we’re generous? Nothing exercises our imagination more than reading an exciting piece of literature. Since the introduction of the comic book format in 1933, the world has embraced these works of literature revered just as highly as classic novels. The most valuable American comics have combined rarity and quality with the first appearances of popular and enduring characters. The set being offered today is truly a rarity and give you the opportunity to take advantage of treasure pieces of literature and collectibles at an unbelievable price. 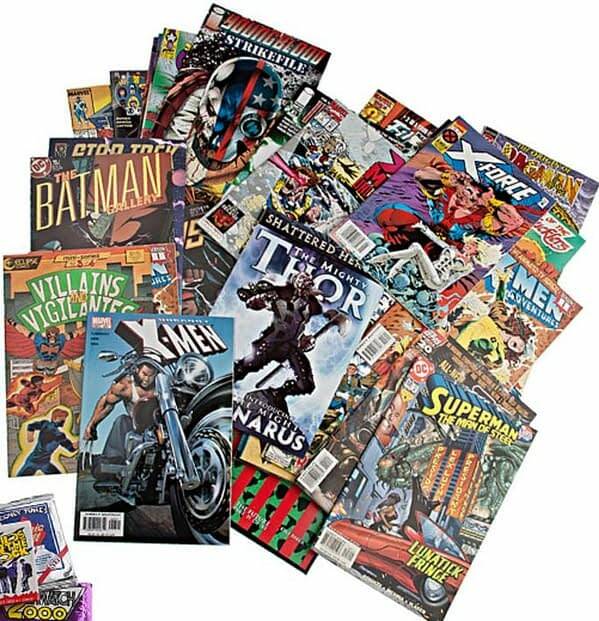 Included in this set are classic issues from X-Men, Spiderman, Batman, Superman, and more! 10 Sealed Packs of Non-Sports Collector Cards and 6 randomly chosen Sealed Packs of Non-Sports Collector Cards are also included. Alone, this set could easily cost upwards of $500 but for today only, you can own it for a fraction of the cost! That’s right, trading cards that are worth even less as well. Many comics fans will know to stay away, but those looking to buy for the comic book fan may not. Will you see such a pack from Uncle Fred and Aunt Ada at Christmas this year?